I grew up on a very large cattle ranch among a most colorful group of cowboys. I quickly became familiar with their ability to communicate in different types of metaphors, mixed metaphors, and mixed up metaphors. I’ll let you decide which type relates to the lesson of the chain. 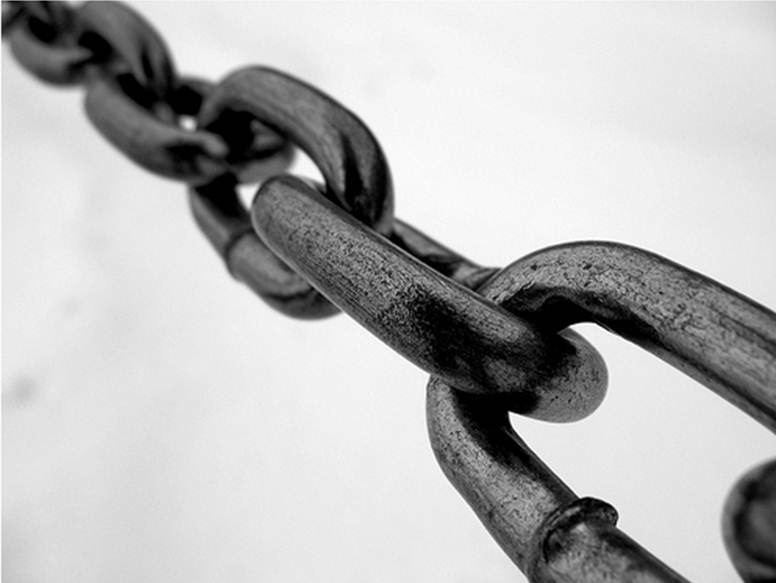 The chain metaphor and analogy was used to remind me in many situations of the difference between “pushing” and “leading.” When pushed, individual links of a chain go different directions, acting independently, and lacking a common purpose, they serve little use. Yet when pulled by a common purpose, each link lends individual strength that collectively fortifies the chain as a whole. Several times in my life I have found myself pushing, not leading. Last night, I found myself once again reflecting on the lesson of the chain. I was standing in the corner of the gym at my son's basketball game. You see, I prefer standing near the corner, away from parents who are exerting their own “chain” powers. Some by pushing and shouting at their kids, the referees, and the coaches. Others by quietly complaining and comparing abilities of said kids, referees, and coaches. I’ve determined no one in the stands seems to be happy, and the swell of chain pushers inevitably spills ugly frustrations out on the court to a group of emotional, changing, somewhat insecure teenagers who are trying to figure out how to function as a pulled chain, linking their individual abilities in a cohesive athletic effort. So I choose to stand apart where I have to deal with my own emotions, independent of the commotion in the stands. Down by 2 points with six seconds to go, my son drove to the basket with a look I’ve seen many times, in various sports from him. He loves last second opportunities. Yet, two players converged, slaps on arms could be heard from across the gym, yet the only whistle was when the ball went out of bounds. Immediately my mind began to fill with thoughts of “Why didn’t he go up stronger? Why didn’t he split the double team better? Could he have pulled up sooner, or jumped a little higher? We’ve been working on the hook shot, why didn’t he use it?” He was despondent, feeling like he had let his coach and team down. You see, Chad is a pleaser. He cares very little what his peers think of him, but he cares tremendously what his coaches, parents, and leaders think of him. He often takes the weight of the world on his skinny shoulders believing because he’s out there, because the ball is in his hands, that he’s responsible for the hopes and ambitions for everyone. I saw his agonizing look first at his coach, who trusted him to be out there. Then to me, his personal rebounder who spends every morning at 5:30 dutifully rebounding shots for him. I realized the links of his chain were being pushed in different directions in his head, and as a parent, the chain was in my hands. I rushed Chad home to meet his quorum for a temple trip, and the time he was gone helped me really reflect on my actions . I remember being 15, being filled with new found athletic ability, yet feeling new and confusing emotions. I remember trying so hard, yet coaches telling me to “slow down” and hustle. The oxymoron perplexed me and frustrated me. Yet gradually, the game did slow down for me, and the accolades of all-state, all region, academic all state, etc. validated and healed my earlier struggles. It then hit me, like a chain to the side of my head, I was comparing my son to what I’d become, not gently guiding him to discover the strength that lies in the links of his life. One of my doctoral professors at BYU, Cliff Mayes, teaches that a role is not a “prescribed list of behaviors but rather a repertoire of possibilities upon which one can draw as he finds himself positioned in various situations.” As a slowly learning parent, I am learning I can recognize the individual links in my children, and help position them in the direction that pulls us together in strength and unity. If I try to push towards a prescribed list of behaviors, I find myself facing the same frustration as the old cowboy pushing his chain.